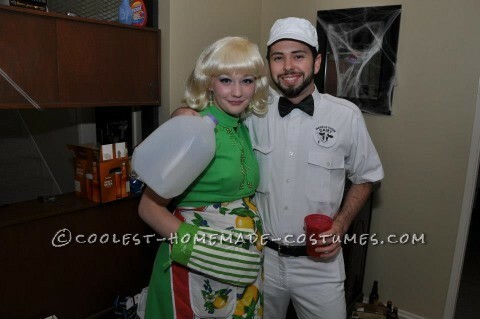 The Best Pregnant Housewife and Milkman Couple Costume! My boyfriend and I could not decide what to do for Halloween for awhile and decided with a week before Halloween to be a pregnant housewife and milkman couple costume!. We found most (if not all) our supplies at Value Village, finding one to two things to start then building a theme around them. We kept our costume decision a secret and no one who knew we were attending the party knew what we were going to show up as. Once we arrived and especially when we were together at the party, people looked at us together and had a good laugh. We were received with a lot of jokes (wondering if the bump was real, and if my boyfriend got me pregnant!). In addition, once the picture of us was posted on Facebook, I had numerous friends message me privately to ask if I was expecting! I definitely was not expecting for real, but it sure was fun waddling around rubbing my fake tummy all night in character. For the milkman: We used a white officer’s shirt, white pants . We spray painted a “newsboy” cap from the thrift store white to match the outfit. We wanted to make it obvious that my boyfriend was a milkman, but not so obvious that we would have to write “Milkman” on his shirt. We found an image on Google that said “Mabel’s Dairy farm”, cut it out and glued it to another old pin to go on the uniform. We decided on this graphic because it was cute, and my boyfriend’s grandmother’s name happens to be Mabel, who at one time, actually did work on a dairy farm! The milkman outfit was completed by painting “Got Milk?” on the back of the hat and wearing black shoes with a black belt. My boyfriend also carried around a milk bottle as a prop for the beginning of the party. Aside from the reception we received, one of the best parts of this costume choice for us was that it had a lot of bang for it’s buck. Each of our ensembles cost less than $40 in supplies. We had a lot of fun and were 2nd in the couple’s category of the couple’s costume contest in house. I think because of the fact it was an original idea and that we kept it all a secret before hand, it was a good surprise for our friends and we were met at the party and online with great enthusiasm.